While Republicans in Congress craft a bill to move the Federal Aviation Administration’s air traffic control services into a private nonprofit organization, Democrats on the House Transportation Committee have already introduced their own measure to reform the agency. The Aviation Funding Stability Act (H.R.2800) has goals similar to those laid out in a statement of principles signed by President Trump last week: upgrade air traffic control technology faster and stabilize the FAA’s funding. But the Democrats’ proposal would accomplish these while keeping air traffic controllers within the FAA. The Democrats’ bill would pull the Airport and Airway Trust Fund, which supports many of the FAA’s services, out of the annual federal budget process, so functions like air traffic control would not be subject to sequestration or potential government shutdowns. It would require revenues from ticket taxes to be spent on the aviation system. The proposal also would order “top-to-bottom” reform of the agency’s personnel and procurement processes. The sponsors noted that although in 1995 and 1996, Congress exempted FAA from government-wide rules governing hiring and acquisition, the agency has not implemented systems to take advantage of it. And the bill would require FAA to use staff across disciplines when feasible. 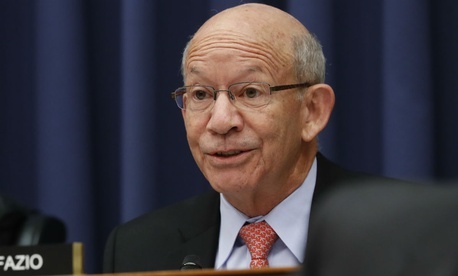 Rep. Peter DeFazio, D-Ore., the ranking member of the House Transportation Committee and lead sponsor of the legislation, said targeted, not drastic, measures are needed to improve FAA’s ability to implement the NextGen GPS-based system for tracking and directing aircraft. The bill attempts to allay the concerns of the National Air Traffic Controllers Association, which last year expressed support for an air traffic control privatization plan introduced by House Transportation Committee Chairman Rep. Bill Shuster, R-Pa. NATCA President Paul Rinaldi expressed support for the Trump administration’s commitment to the principles laid out last week, although the union will not formally endorse the plan until a bill is available for evaluation. Union spokesman Doug Church indicated Monday that air traffic controllers would support the Democrats’ bill as well. But Shuster said in a statement that Democrats’ proposal is merely an attempt to revive outdated reform proposals.